While my subconscious mind uses procrastination against me, my conscious mind has many tools to stop procrastinating. I am discovering that my perfectionism and its tool, procrastination, are deep-seated. They go back many, many years. They are habits that are hard to break. It takes a multi-pronged approach to battle this war. Trello is a pretty cool tool for organizing workflow. It’s a visual interface organized into “boards” and “cards” that you can just drag between boards. The cards can have color-coding, checklists, deadlines, and other super handy things. You can let your team access your boards. I use it on my iPhone and I also view the projects on the web. When I’m getting real serious, I print the cards to post on my wall. Download it free for the iPhone or for Android. I heard super bestselling author and movie writer, Donald Miller, on Beyond the To-Do List podcast. He was talking about taking 4 years to write a book when it used to take under a year. He started studying the psychology of procrastination and came up with a one-sheet tool to help him plan his daily tasks. He wrote his next book in just 4 months and the writing was better! I downloaded the free Storyline Productivity Schedule and got more done in the first 30 days than probably the previous 6 months. “Nothing changes the world if we don’t finish it,” says Donald. The Storyline Productivity Schedule helps me finish things. My iPhone has given me ADHD. There I said it. I mean, not to deflect the blame or anything, but all I do is pick up my phone to check a word definition, lookup a date in Wikipedia, or some other quick task, but before I can even get to it, there’s a TXT message, so I reply, and then I see that red little dot on Facebook, then I might as well check to see whether I have any activity on Vine, but all the latest posts are so entertaining and outright important, and before I know it, I put back down the phone after 30 minutes and I’ve forgotten what I was doing. Distractions are brutal. Sometimes it all starts with a simple chime telling me there’s a TXT message or a phone call. I use Do Not Disturb early, I use it often. Is It ADHD or My iPhone: Transforming Your Brain From Scattered to Centered by Dr. Alicia R. Ruelaz. A lot of time, I just have to remind myself not to procrastinate. Easier said than done. 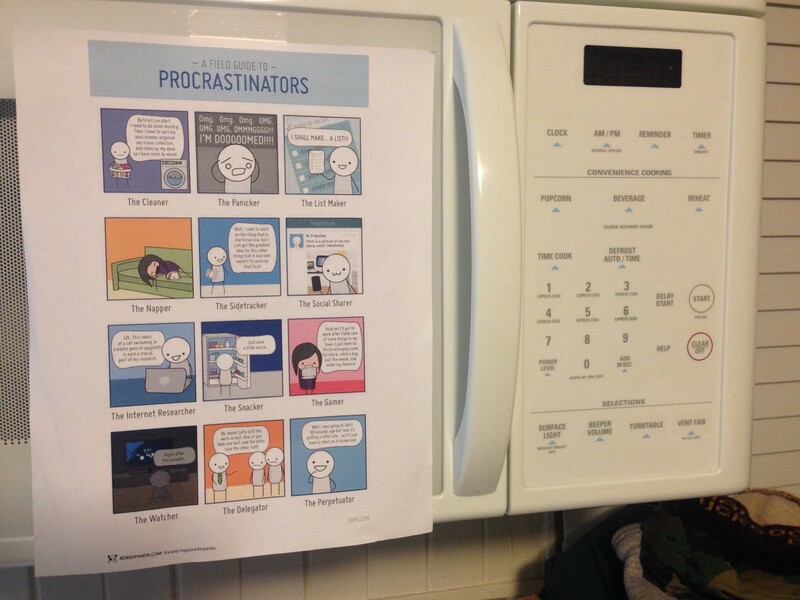 I saw this nifty meme, A Field Guide To Procrastinators, and I saw myself in nearly every one. So I printed it and put it in a prominent location. A quote by Niccolo Machiavelli has been inspirational in my battle against procrastination. I came across the Renaissance philosopher and founder of political science after Tupac Shakur’s passing the year after I graduated high school. I was curious what all the hubbub was about between 2Pac’s switching his name to Makaveli and the actual Machiavelli. Years later I happened across the latter’s renowned book, The Prince (Penguin Classics), in a second-hand store and bought it. It wasn’t until I quit my job last year that I had enough time on my hands to give it a read. If you’re a king (or prince) planning to invade the kingdom (or princedom) next door, you will certainly want to thoroughly examine this treatise. For me, however, at that time of turmoil and resolve, the most captivating part came in the last few pages. I still read it often when I leave the house. What remains to be done must be done by you… God will not do everything himself. Like most task-oriented people, I make lists. Plural. I have many lists. Some are posted on my wall below Machiavelli’s quote. I scratch things off of lists and consolidate lists into one. I make short-term lists, long-term lists, and dream-lists. I admit that it’s kind of crazy making, but it’s what I do. They say, what gets scheduled gets done; what doesn’t get scheduled doesn’t get done. Lists remind me to schedule the tasks. All the team members can see what needs to be done and what stage the task is at. Any task in the To Do column is waiting to be taken on. A good sense of accomplishment is felt from moving a task from one column to the next. Trello also organizes the boards into these lists by default. 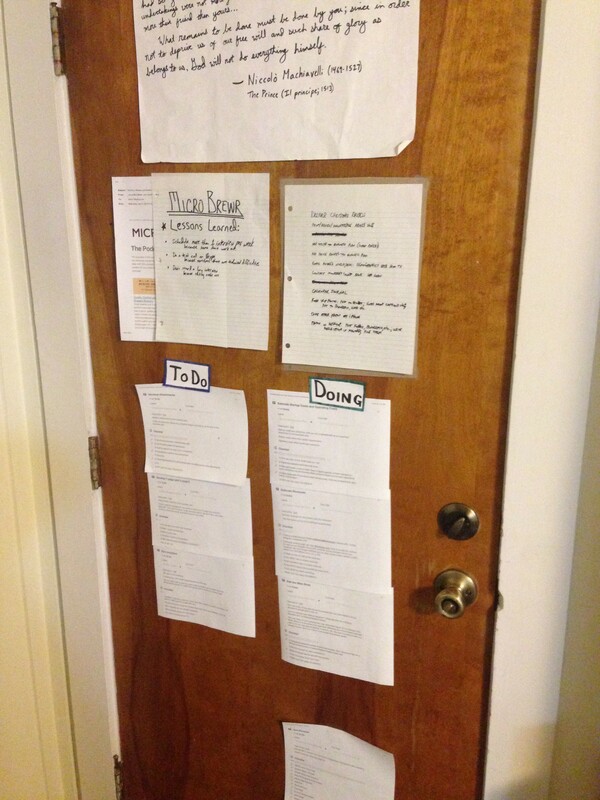 When I print and post them on my door, I keep them organized by this structure and it has helped to keep me on track. These are the latest tactics and tools that I use to combat procrastination. Because procrastination is rooted so deeply in my psyche and actions, it takes a multi-pronged approach to beat it. Each method looses its efficacy after a while, so I rotate new tactics into my arsenal. I pine for a day when I have just one to-do list. A day when the walls of my home are not cluttered with lists, tasks, quotes, and fliers, just to remind me to finish things. But God will not do everything himself. Share some of your tools against procrastination in the comments below.